I noticed Wikipedia was extraordinarily slow. # 14:00 RobH: updated redirects.conf and pushed change for orphaned domains. # 14:06 RobH: Pushed out old redirects.conf and restarted apaches. # 14:10 RobH: Site back up, slow as squids play catchup. So there you have it. A broken configuration file got released, breaking all the backend Apache webservers. It was fixed, but seems that the cache is still being rebuilt, so it might be slow for a while. In the meantime, why not read up on the Wikipedia server cluster? Or some graphs? For example, the daily bandwidth usage: pmtpa is their Tampa, FL colocation facility (serving the US) and knams is in the Netherlands (I think). (yaseo, the yellow one on the legend with no data, is a Yahoo data center in Korea.) You can see that the US cluster is hitting 3 Gbps, while the Europe cluster is exceeding 5 Gbps (!). My concern is mostly that, historically, DNSBL providers have gotten carried away and started to list whole netblocks, and then whole netblocks of their enemies who aren’t sending spam… And pretty soon, you’re getting a lot of false positives. (Non-spammers who falsely test “positive” in spam checks.) In other words, you start rejecting legitimate e-mail because the blacklists tell you it’s spam. That’s a risk I’m not willing to take, and it’s an even more unacceptable risk for a business to take. zen.spamhaus.org: 100.00% matches, 101.77 ms. average response time. This merges all the Spamhaus zones, which include not only a list of known, persistent spammers, but also a list of exploited machines, and their “Policy Blacklist,” of things like cable modem netblocks. t1.dnsbl.net.au: 100.00% matches, 260.61 ms. average response time. This is also an aggregate zone of an Australian DNSBL provider, with very good results. karmasphere.email-sender.dnsbl.karmasphere.com: 100.00% matches, 96.31 ms. average response time. hostkarma.junkemailfilter.com: 85.71% matches, 552.92 ms. average response time. It’s very slow to load for me, for some reason, but it has good results. psbl.surriel.com: 50.00% matches, 394.72 ms. average response time. An automated blacklist based on Spamikaze. Incidentally, Spakikaze reports some other blacklists using their code, which I might want to evaluate, too. ubl.unsubscore.com: 42.86% matches, 52.75 ms. average response time. A bit about the list is published on the excellent OpenRBL Wiki. Even though it comes after a list of DNSBLs with “100%” matches, 42.86% is actually very good in the real world. Between the OpenRBL site and Spamikaze’s list, I do have some more that I’d like to experiment with. I should again reiterate that this was a very non-scientific test; it evaluated fewer than 20 IP addresses which have been blacklisted by my servers in the past few days. It assumes that their servers get spam from the same sources that I do; given that many large blacklists contain millions of IPs, this isn’t an accurate assumption at all. All these statistics are really good for is pointing out blacklists that are worth taking a look at. 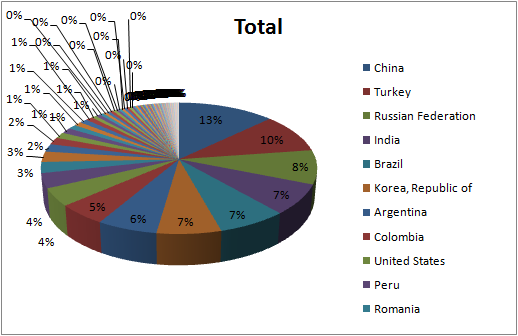 Since I was curious… A graph of spamming IPs I’ve encountered in the past 14 days (1,075) by country (78 total). I’d estimate that about 1,070 of these 1,075 IPs, by the way, are infected desktop machines. A new reason to keep your anti-virus current: so you stop sending spam! It looks like T-Mobile’s going to start selling a phone (made by HTC!) in about a month running Google’s Android. Engadget has more on the phone. What interests me more than anything is its openness: Palm has an SDK, and so do most of the other smartphone makers. But none are totally free, or actively promoting their use. Android seems like the perfect phone for geeks. They even had a Developer Challenge giving away lots of money for applications, with some neat ones as results. There’s another gallery of applications out there, too. T-Mobile has accidentally (?) published the manual online, and Engadget has an interview with the CTO, who basically says that, while they don’t really like unlocking phones / tethering, they don’t intend to cripple this phone. In addition to McCain, the KKK has announced it will be in attendance, too. This should be, err, interesting. So I’m admittedly biased against McCain, but I couldn’t help but find his decision to suspend his campaign to be… Strange. For some reason (maybe it’s because it’s what we did in school for years? ), I couldn’t help but view it as a strategic move. And in that case, it was brilliant. For a candidate who admitted in January that “[t]he issue of economics is not something I’ve understood as well as I should,” and who, ten days ago, said, “The fundamentals of our economy are strong” despite the difficult times, the move to suspend his campaign shows just how seriously he takes the issue. It’s so important that he’s putting aside his campaign to valiantly fix it. The move was doubly brilliant, because while McCain suddenly gave the appearance as being very concerned about protecting Americans who’ve lost it all in the economy, it also leaves Obama looking like he’s selfishly continuing to campaign, ignoring the issue. So why did McCain propose cancelling the debate? In a word: politics. By flying into D.C. as the savior he might appear as a man of action to people who don’t know how the Senate works. The reality of course, is that Obama and McCain’s appearance in Dodd’s office would instantly turn the entire event into a political circus. The NY Times also has an analytic article on the politics of this. The view there is that Republican members of Congress know very well that throwing $700 billion at Wall St. in a big hurry with no oversight is not popular with the voters. On the other hand, they don’t want to buck their own President who still has a modicum of popularity with the the Republican rank and file. They are hoping McCain can bail them out. Democrats don’t want to be seen as obstructionists, but they also see the bailout for what it really is: a ploy to spend so much money that a future President Obama’s hands would be tied for lack of money. In effect this move is Bush’s attempt to “rule from the grave” by severely constraining what the next President can do. Oddly, it might constrain McCain more than Bush since he (McCain) has spending plans, too. He also links to a survey of 1,000 Americans, in which 86% of respondents says that the debate should still be held. (50% saying it should be “Held as Scheduled,” and 36% saying it should be “Held With Focus on Economy.”) A plurality of respondents (46%) further said that it would be bad for America to cancel the debate. I thought I’d share my latest discovery. Linux has two “random number generators” as pseudo-hardware devices (that is, they’re in /dev, but aren’t actual hardware, much like /dev/null.) They’re called /dev/random and /dev/urandom. I never knew, or even thought much about, the difference. /dev/random will “block” if it runs out of entropy. /dev/urandom is less secure in that it will keep serving data, but it will be from a less-secure pseudo-random series. The difference is quite useful. For example, when encrypting something, it’s important to have “good” random numbers, hence /dev/random is indicated. On the other hand, the caching resolver I’m running (localish-only) on this server uses /dev/urandom: randomness prevents cache poisoning, but I really don’t want my DNS queries waiting for the “entropy pool” to get refilled. As an aside, some tools to measure the effective randomness of your nameserver’s ports. Comcast, pretty impressively, ranks “Great” on the tests, as do the various caching nameservers in use on our webserver. I tweaked the policyd rules and my main.cf a bit more, so that my mailservers lets PolicyD do most of the examinations. The net effect was that Postfix itself (my mailserver, or MTA to be more accurate) stopped rejecting as many hosts, instead allowing PolicyD, a plugin I use to do some more advanced filtering, to handle those hosts. And this is a good thing because Postfix would just reject the message, whereas PolicyD adds the host to a blacklist first. I significantly revamped the page listing the banned hosts, both to cache the output (since each of the hundred hosts now involves running 6 DNS lookups and parsing two multi-meg text files), and to list a lot more output. I don’t currently use any DNSBLs (DNS blacklists), but set the page up to show whether a given host matches those blacklists. At the time of this writing, 96 of the 100 most recent hosts have been in the Spamhaus XBL, which lists “hijacked PCs infected by illegal 3rd party exploits.” 96%! Spamcop is the next best blacklist, with 76% matching, followed by 64% matching results from the Spamhaus PBL, which lists IPs that are for “end-users,” like residential cable modems and dial-up lines: things mailservers shouldn’t be on. (If you’re like me, BTW, the answer is, “Yes, you can remove yourself” if you run a legitimate mailserver on those netblocks.) I’ve also had good results with the NiX Spam blacklist, which I found mentioned on the page for OpenBSD’s spamd. I’m pretty strongly against using blacklists for anything definitive, as they’ve been historically fraught with problems and abuses, with many administrators eager to list whole netblocks, or even people they don’t like. And my simple setup seems to be just shy of 100% effective in stopping spam, so I have no incentive to go for blacklists anyway. Plus, this is an analysis of how spam shows up in blacklists, but that doesn’t tell us anything about how many legitimate e-mails show up in those blacklists, which is an equally important metric to consider. zen.spamhaus.org, which blends the XBL and PBL, plus a general list of spammers. sorbs.net, which has myriad blacklists; pay special attention to “web” (127.0.0.7) and the dynamic IP list (127.0.0.10). bl.spamcop.net, which is quite well-known. From the BBC today: Russian warships have set off for Venezuela for joint exercises unprecedented since the Cold War. To my elected officials: please, please, please don’t allow for Cold War II. I’ve for a long time perceived that increasingly large parts of the world hated us. And it’s easy to think, “So what if Venezuela hates us?,” or “So what if Iran’s crazy leaders hate us?” But what about when all of these countries start banding together, and get support by an increasingly-deranged superpower with plenty of nuclear weapons? Mutually assured destruction doesn’t work when the enemy is suicidal or just downright crazy. I’m really not convinced that the MAD theory would keep Hugo Chavez or Ahmadinejad from launching nuclear weapons. Our current foreign policy reminds me of a schoolyard bully. We probably have the biggest and best military. We can stand up, flex our muscles, and get our way. But bullies don’t know how to use diplomacy and avoid fights, only how to come out bloodied but on top. We shouldn’t go praising Russia or Chavez anytime soon, but, uhh, it’s high time we did something other than goading them into war.